Why do you matter to them? What is it that you do or sell that fascinates them? In other words, stories that further the customer experience are ones which serve as enablers of brands. They help brands to build personality and create a connection with their customers. But is it possible to narrate a visual story on social media? In case you are wondering about the power of visual content on social media the infographic below should dispel your concerns. Let’s take for example, Instagram. Instagram has always been a popular medium to share visual content. But any modification to images usually requires a clunky collage-making app. It also requires a bit of preparation if you want to share anything more than an image or video. That has now changed. At least with Instagram. Instagram now allows more than one picture per post. According to their recent update, you’ll be able to share as many as 10 photos or videos via a swipeable gallery. These posts have a small icon and a series of blue dots below the first image. Each photo used must be square and can be edited or can have filters applied all at once. This is a great feature. But, how can you use this feature to create a visual story that engages your audience? In this post we will look at ways in which you can tell a visual story on social media in a single post. Many Instagram users are looking for cooking, decorating, other household and DIY ideas. The new feature lets you share this content in an interesting, digestible format. Take lifestyle magazine, Real Simple for example. They publish short versions of their online content via Instagram Stories. These mini-articles and videos convey useful information without being difficult to absorb. VIDEO: This shoulder #stretch can save you in the middle of a workday. All you need is one rolling desk chair and a tiny bit of room! Depending on the content, there is often a call to action that takes people back to the Real Simple website. You’ll often find the call to action in the post or at the end of the story. You too could share similar content for your business. For example, take a look at the content you share on the blog. You could find a how-to article that you could break down into a few slides or videos to share. Once you have created the images and or videos you need to upload them in sequence. The sequence would work well with a cover image and a conclusion image. Consider adding a call to action to an URL that your audience can visit for more information. Complex statistics and data from reports is quite hard to comprehend. Images however, can be a lot more engaging and easier to understand. So why not use them to convey quantified data? This works well if you want to create an impression on your reader. Why? Because we remember images much better than we remember words. Take for example this post about A/B testing. The author, Will Kurt uses graphs to illustrate the difference between the results achieved by “scientist” marketers and “impatient” ones. You know about the importance of visual storytelling in business. But, practicing it isn’t always easy. The usual norm with presentations is to use things like tables and bullet points. There is nothing wrong with using them. However, the content can all too often come across as overwhelming or confusing. So, how do you create a presentation that engages your audience? What information do you want your audience to know? Structure your presentation accordingly. To help with the process consider including the elements listed below. Then storyboard the slides and create the presentation. Craft your opening: Consider starting with a question, story, or stat to hook your audience. Let your audience know what’s in it for them. Use a hook: Try to boil your main idea or point down to one sentence. State it near the start of your presentation to create intrigue. Use it in other parts of the presentation as well. 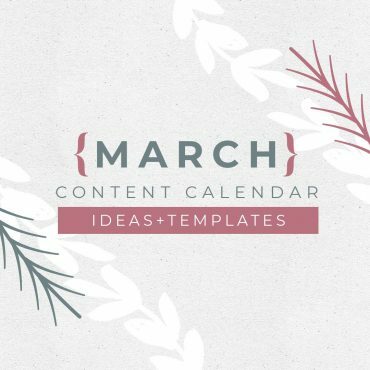 Share your roadmap: Let your audience know what the outcome will look like. For example – “by the end of the presentation you will know how to do Y”. Construct your outline: Decide on your major sections. Then use the following to make each section and subsection engaging. Key points, data and stories that will lead your audience from awareness to action. Let’s look at two examples from which we can learn to tell a visual story on social media. 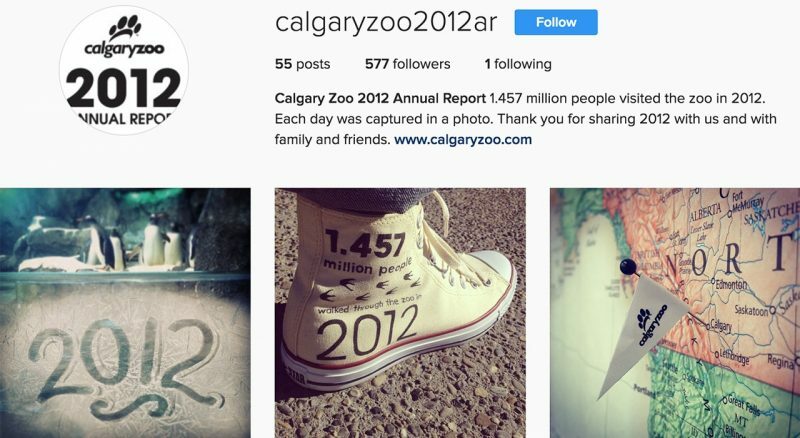 The Calgary Zoo published its 2012 annual report on Instagram. The report consisted of 55 photos and captions. These took the place of pages and came together to tell a compelling story of the work the zoo had done over the year. In this second example, the SlideShare presentation has some excellent takeaways we all could learn from. You could promote it on social media by sharing a few key slides to create enough curiosity. That in turn will encourage people to click through to the actual SlideShare. Visual content can convey emotion, mood, narrative, ideas and messages. All of which are essential elements of storytelling. It’s been a key growth factor for image-driven networks such as Pinterest and Instagram. Today more businesses are using such networks to help share their brand story. However, good storytelling is something that doesn’t just happen. You need to be intentional about learning how to tell stories and practice the craft. One of the easiest ways to get started is with events. They are great occasions to tell stories. For example you could combine interviews and other tactics to tell an engaging story. Much like Southwest Airlines. Cuba was launched as the 100th destination for Southwest Airlines. To mark the occasion, they sent photographers to capture some visuals of Cuba. They did this even before the first flight landed in Havana. You could create a story like Southwest, to highlight your event or milestone. Consider using interviews and stories to add add variety to your content. You could do these around employees, customers or other unusual items and events. What is important in the telling of these stories is to stay on brand. Treat your brand stories like exciting events. This will help humanize your brand and keep your audience engaged. Any form of content created by users of an online system or service is called User Generated Content (UGC). This content is often shared via social media platforms. 4) Most consumers know the difference between paid and earned media. So this a better way to create awareness. 5) An opportunity for brand development with the help of your fans. 7) Being able to influence buy decisions. 76% of Instagramers declare that receiving likes encourages them to publish more. 65% of users would feel flattered or honored if a brand liked one of their posts. In other words, reposting UGC from users, on your account, encourages them to provide more. The pictures had to be of users exercising in Lululemon. The post should include the hashtag #thesweatlife. The campaign was very successful as it built on the brand lifestyle – being active. The emotional connection customers have with the brand. Here are a few tips to help your UGC campaigns become a shareable and relatable visual story. Run campaigns that tap into an emotional connection users have with your brand. Your campaigns should relate to the greater lifestyle your brand represents. Encourage the customers who love your brand to post images of them with your brand. Reward them for participating by sharing those images. Encourage users and customers to create UGC for you, by reposting existing UGC. Use a catchy hashtag that relates to your brand lifestyle for each campaign. Make it easy for customers to buy products directly from customer content. If you want to promote a product, what better way to do it than to show your customers what it can do. In other words, give people ideas for using your product to show them what they can create or do if they buy it. Vitamix is a popular blender brand. The company uses Instagram to showcase products created by their blender. This post, for example, introduces the idea of making hot soups. Every full-size #Vitamix can make soup in about 6 minutes. Explore how to make hot soup using the link in our profile. The post below shows their audience how to make almond butter. So with Instagram’s new update you could show your audience how to make soup or almond butter step by step while using your product. Our friend, @downshiftology, shows you just how easy it is to make Homemade Almond Butter in one minute with your #Vitamix. #Recipe link in bio. The same idea can work for a range of physical products from makeup to skateboards. However, posting content for the sake of content has no purpose. You need to ensure that your content entices people to purchase your product or service. Avoid annoying them with aggressive sales messages. Instead be genuine and entertain your audience. This way you’ll be able to draw more people to your website. There is more to personal shots than selfies. In fact personal shots can enable you to connect on a deeper level with your audience when telling a personal story. Consider using images from your smartphone. These photos can make your readers feel like they are in the moment with you. 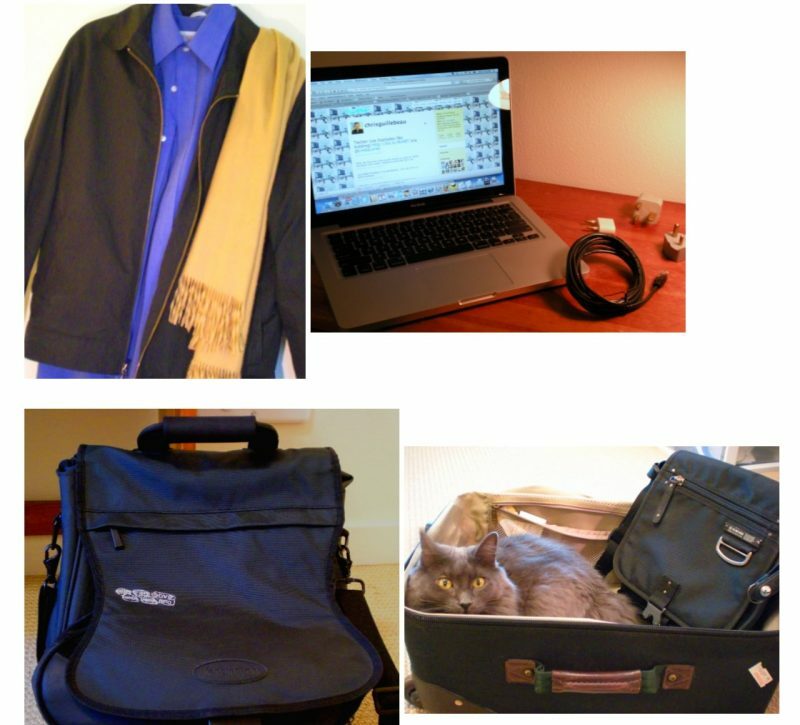 Chris Guillebeau, in this post, answered questions about his packing lists. He did not post a checklist. Instead he shared a series of images which would work well with Instagram’s new feature release. People who donate to charities like to know where their money goes and how it impacts people. This true not just for charities but other businesses as well. A study from Harvard Business School looked at transparency in a restaurant setting. More specifically, they looked at situations where the cooks and customers could see each other. In other words, they looked at providing transparency during the food prep and dining experience. They found that customer ratings improved. There was a 17% improvement in customer satisfaction and a 13% improvement in the speed of service. In this case it would seem that customers are happier when they feel they are part of the process. It is also likely that transparency encourages people to be more thoughtful and intentional in the decisions they make. Charity water does an excellent job of being transparent. They tell stories of communities changed by the benefits of clean drinking water. So, show the world how your actions are making the world a better place and what you do to give back to society. Pat Flynn doesn’t just help entrepreneurs. He used funds raised during his birthday to go towards supporting Pencils of Promise. Acquiring the best talent isn’t easy. But what if you could make your business workplace inviting, welcoming and aspirational? Consider showing off your staff and provide highlights of what it is to work in your business. Share your employee stories. By doing so you give your audience access to your brand on a human, personal level. Your business is a collection of people working towards a common purpose. Telling the stories of those people is not any different from telling the story of your business. How do you pull these stories together? This helps humanize your brand and makes it more interesting and relatable. Take this post on a Zappos employee for example. This is where behind-the-scenes content comes in. It’s the kind of content that also helps build trust and forge deeper connections with your audience. Fitplan is a fitness brand that delivers the workout programs of top athletes. They share some great behind the scenes shots of their team during video shoots. Take for example this behind the scenes shot. It was taken during the filming of fitness superstar Rob Riches workout program. It is a good example of behind the scenes visual storytelling. There is no shortage of timely opportunities to capitalize on in social media. But real-time marketing takes preparation. Being relevant also means a deadline. However, meeting deadlines alone don’t make for great campaigns. The best real-time campaigns are ones that reflect your brand’s voice and values. So plan for situations your brand would respond to. Having said that, to capture real-time opportunities requires a degree of flexibility. This allows you to embrace unexpected time-sensitive opportunities as they arise. For example, General Electric noticed increased conversation around encouraging females to join STEM roles. (Science, Technology, Engineering and Math (STEM) roles). They jumped into the conversation and shared their goals via a series of tweets like this one. 20,000 women in technical roles by 2020. On their Instagram channel they share specific stories about their female engineers. Like that of Jenna Schreiner. Take advantage of trending hashtags to give your posts a boost in organic reach. Add your commentary on real-time trends or large events as they happen. Join in on conversations that people are having about them. Do you think that getting the message out only starts once you are ready to launch? If so, you could be in for nothing more than the sound of crickets. Because you started to market too late. You need to build buzz online well in advance of your launch to have customers queuing up. Building online buzz takes work, but it’s well worth it. For example take companies like Apple. They earn huge coverage they get before they even launch a product. Rumors swirl and excitement builds. Then finally Apple announces the product (which won’t be available for a while). When Apple finally does ship the product, they tend to break sales records in the first few days. In fact, when Apple released the iPhone 6, they sold 10 million units in the first three days alone. Your business may not be as big as Apple but you can still create a sense of anticipation. The trick is to keep an element of mystery while hinting at things to come. For example you could post sneak previews and teaser videos. The possibilities are endless. But if done right, you are likely to make more of a splash when you do launch. Looking to build your customer base and keep people coming back for more? The answer may lie in rewarding your customers. Because so many brands are focused on driving traffic and sales. It can be easy to forget that the focus should be on engaging your customers. So how can you grow your customer base? Reward them and become worthy of remark. Social media and online communities are perfect for a customer rewards scheme. They offer many possibilities to business owners in any field. Virgin Atlantic for example ran a “Flying in the Face of Ordinary” campaign. As part of the initiative they sent their marketing team and cabin crew to cheer up people in Boston. This involved doing good deeds and making special deliveries. They used Twitter to find followers in the Boston area. They looked for tweets around having to wait for a train or other everyday annoyances. 100 cupcakes to a blogger and his co-workers. Giving a woman a ride to a business meeting and preparing her for the cold with a pair of gloves and a hat. So as you can see you can narrate a visual story on social media and especially on Instagram. However you need to be aware of common mistakes that people often make. For example, a common mistake people make when trying to tell a visual story is they share busy photos. In other words, photos that have a lot of detail. This leads to photos that are cluttered, with too many focal points and that can confuse the viewer. Instead share a series of them almost like you were watching a movie. To make narrating these visual stories easier use Instagram stories. You could also use the Instagram carousel feature, to share 10 images and videos in a single post. To help you make your visual story on social media effective and avoid common mistakes, download the guide to storytelling with visual science below.